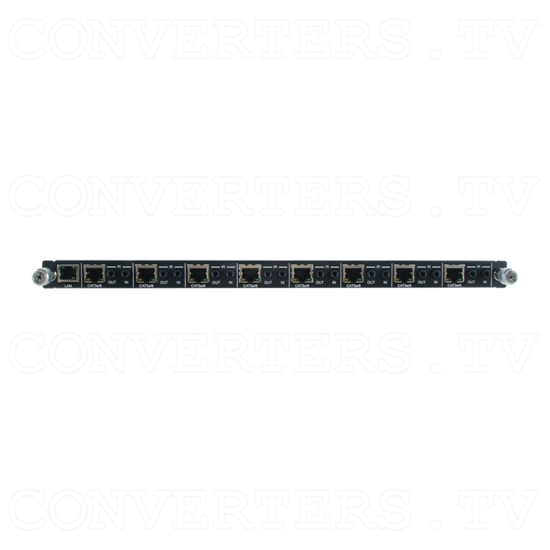 The HDBaseT Input Module 8-Port 4K UHD comprises 8 HDBaseT connections which allows the transmission of 8 HD sources. 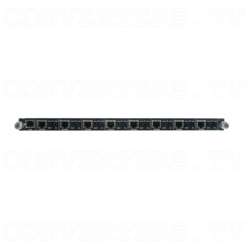 The HDBaseT Input Module 8-Port 4K UHD supports bi-directional IR and RS-232 signals, PoC (Power over Cable) and LAN serving over single runs of CAT5e/6/7 cables up to 100m@1080p (8-bit/12-bit) or 70m@4K. Video resolutions of up to UHD 4K@30Hz, PC WUXGA@60Hz (RB) and 3D signals are all supported by the HDBaseT Input Module 8-Port 4K UHD, along with LPCM 7.1CH, Dolby Digital Plus, Dolby True HD, and DTS Master Audio. The HDBaseT Input Module 8-Port 4K UHD supports bi-directional IR and RS-232 signals, PoC (Power over Cable) and LAN serving over single runs of CAT5e/6/7 cables up to 100m@1080p (8-bit/12-bit) or 70m@4K. Video resolutions of up to UHD 4K@30Hz, PC WUXGA@60Hz (RB) and 3D signals are all supported by the HDBaseT Input Module 8-Port 4K UHD, along with LPCM 7.1CH, Dolby Digital Plus, Dolby True HD, and DTS Master Audio.